Wood, plaster, graphite, fabric, thread and natural materials. The drawings are 5"x7". I live on 7 acres in a small house in the woods. A lot of time is spent outdoors clearing, moving, stacking, trimming, gathering and walking. The work that I make is a direct result of the experience of forging a place for one’s self, both literally and metaphorically. I am thinking about my relationship to the natural world and about what it is communicating to me. Sometimes this communication takes the form of a whisper: pure breath, full of life, and powerful in its subtlety. 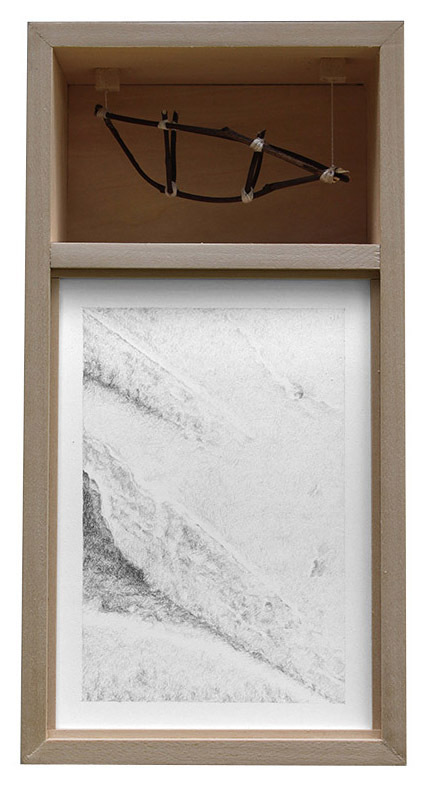 In this series I call “Whisper Boxes” I’m exploring two ways of being with the natural world. One is through quiet, simple observation and reflection while the other is through physical manipulation and collaboration. I think this duality is indicative of the way we live our lives. Sometimes physical action is required but this must be balanced with observation and reflection.